According to local legend, the heavenly, now-iconic combination of melted cheese atop a burger was invented back in the '30s right here in Louisville, at the now-defunct Kaelin's Restaurant. Given this history-making mark on the world, it stands to reason that the city's burger spots would feel a special duty to create some of the finest burgers in the land... which they must have, because they did. We went around the whole city eating them to find the very best ones for you to enjoy. Yeah, it’s a hard gig. For Nirvana, it was "Smells Like Teen Spirit." For Grind, it’s the B&B burger. 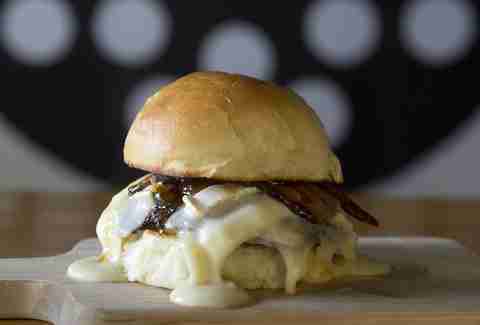 Made with bacon, brie cheese, and habanero jam, it’s one of many standouts in this food truck-turned-neighborhood eatery. Now with two locations, this slightly odd -- yet delicious -- fusion restaurant offers excellent takes on both of its namesake menu items. 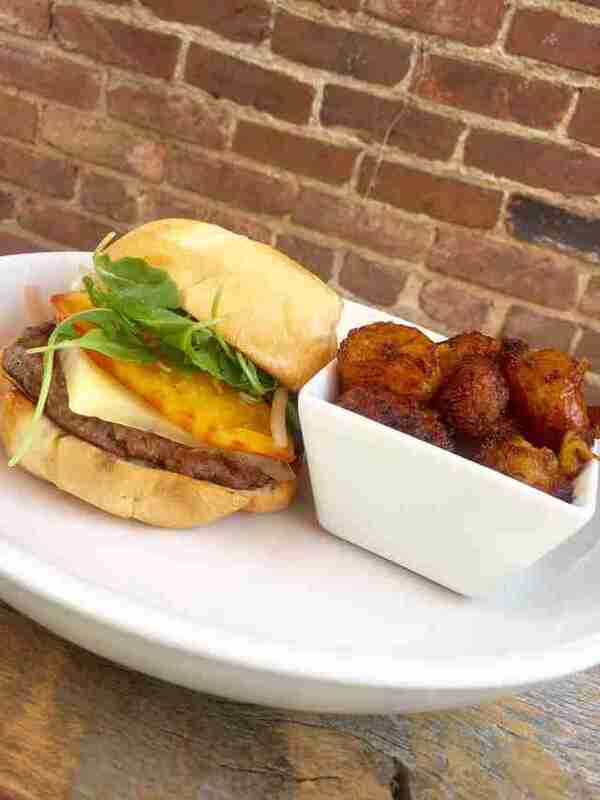 Some favorites include the Argentinian (which comes with chorizo and chimichurri sauce; the B.B.B. (bacon breakfast burger) whose appeal boils down to four words: maple syrup-glazed pork belly; and The Local Burger (of course), made with grass-fed ground beef and Kenny’s Gouda cheese. This meat temple sings like a dozen Hendrixes in heaven, with elk, antelope, venison, and kangaroo burger options. 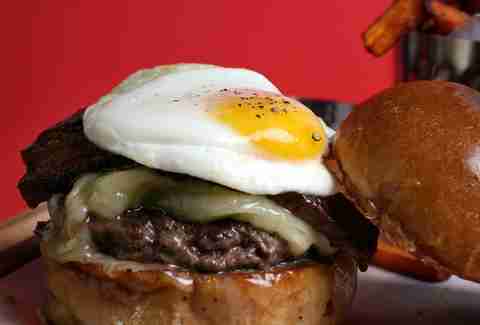 The menu suggests multiple combinations for toppings and other accessories, which is why burgers like the duck can end up with a fried egg on top. Pro tip: no one in the history of the world has ever regretted ordering fries that have been cooked in duck fat. At this semi-suburban highlight, some of the best burgers are hiding in plain sight. Despite a chain-in-waiting vibe and a family-friendly atmosphere, the grass-fed, Kentucky-raised beef and bison burgers offer some of the most surprising bites around (and the ahi tuna burger never disappoints). Put some sliced avocado on it for extra creaminess. 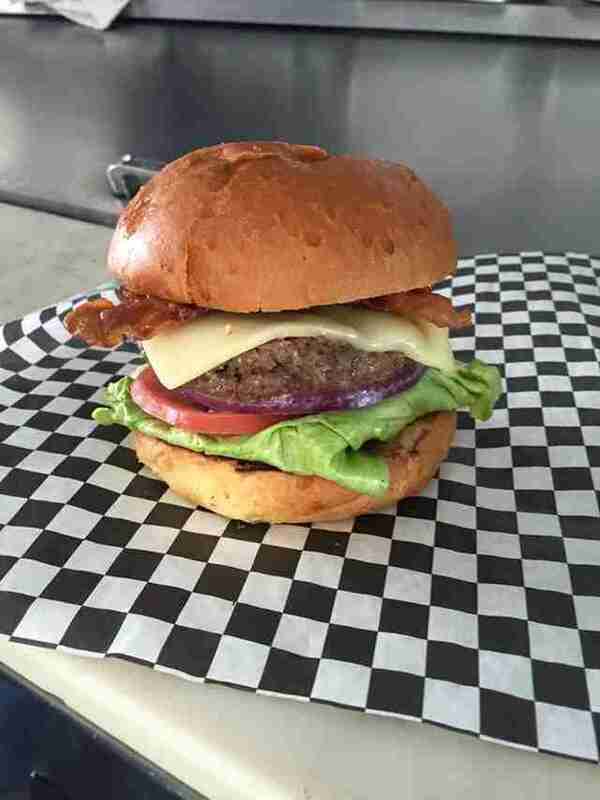 Follow and find this truck for a truly great burger, handmade by the chef on a black rock basalt stone and served on the side of the road. Among an array of excellent, grass-fed beef burgers, the Inferno, with Cajun seasoning and pickled jalapeños, really stands out. 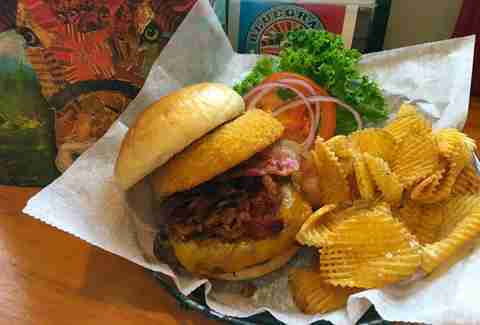 It’s so easy to do burgers well and make nearly everyone happy, and Big Four has done so, quickly doubling its footprint with smashes like its Queso Burger, the Big Bleu, or the California. And it has superb milkshakes to boot! Some places are classics… some are just old. The ol’ Burger Boy had become less classic and more… the other thing, until a new owner saved it from itself a few years back, giving the city one of the few 24-hour options around. The prices are hard to beat, and no amount of innovation can ever replace something like the Burger Boy Burger. Always add onion rings and chili cheese fries on the side. Another classic, Ollie’s Trolley pops up occasionally elsewhere, and is still a fun diversion. Step up into the trolley car and place your order. You might need to eat it in your car, especially in winter, but that’s OK. It’s just part of the charm. Oh, and this place has great fries, so don’t skip ‘em. 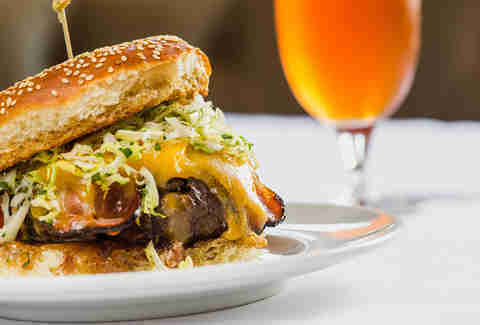 Proof on Main has a fantastic burger -- made out of bison -- but it’s the Jezebel sauce that gives it a fruity, earthy bent, and the Tillamook cheddar and applewood-smoked bacon certainly don't hurt, either. Go for a side of the crispy cauliflower -- it’s better than it has any right to be. The walls of Harvest are adorned with large photos of the various Kentucky farmers who grow and raise the ingredients you’ll find on your plate, which speaks to Harvest’s unwavering commitment to sourcing only the freshest local vegetables and meats. The burger is no exception; it's a perfectly cooked patty of local beef, currently topped with tomato jam, triple-cream brie, and lettuce on a positively addictive pretzel bun. 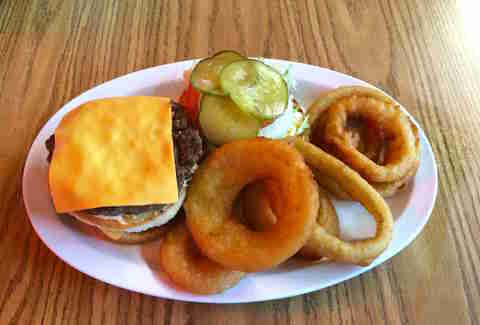 When it comes to the Bambi Burger, the "almost famous" delicacy of one of Louisville’s most infamous dive bars, you can order yours one of five ways: no sides, with chips, with fries, with onion rings, or with your choice of appetizer. That’s it. 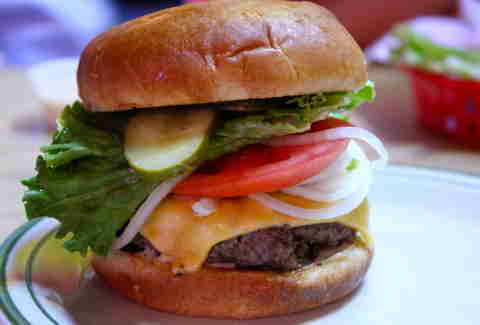 The Bambi Burger remains the same regardless of your side selection, dressed with American cheese, onions, tomatoes, pickles, lettuce, and mayo, just as a classic dive bar burger should be. Every Shady Lane Cafe burger is hand-pattied and cooked to order. The secret to this incredibly delicious burger lies in the secret spice blend used to season the beef just before it hits the cast-iron griddle. It’s been a cult hit for years and is the shining star of this tiny neighborhood cafe. There is so much to love about Mayan Cafe, NuLu’s venerable veteran restaurant. Chef Bruce Ucán infuses the authentic flavors of his Yucatan heritage into this farm-to-table restaurant, and has firmly established himself as one of the most influential and humble chefs in the state. He simply gets everything right, including his Mayan Burger, a perfectly cooked, grass-fed beef patty, which comes slathered with chili aioli, topped with greens, pickled onions, mozzarella cheese, and tomatoes, and served on a warm pretzel bun. 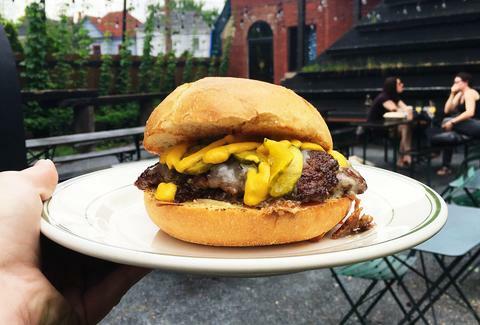 The menu at this local beer mecca changes on the reg, but the burger never misses the mark. Always made with local beef and generally adorned with melty cheese and signature frites sauce, this burger only needs one of the many craft brews on offer (the bartenders will be happy to recommend the ideal pairing) to make it perfect. Lindsey McClave is a food, wine, and travel writer who believes a burger a day will keep the doctor away. Follow her adventures in food and travel on Twitter at @FoodieGirlKY. Peter Berkowitz is a freelance writer from Louisville. Follow him on Twitter: @PBQTP.